Philadelphia, PA (September 27, 2010) – In June, the EPA extended the deadline for the enforcement of the lead paint regulations, provided that training and certification requirements are completed by the end of September. 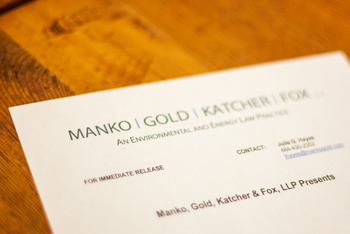 In order to understand the legal ramifications and potential penalties surrounding the lead paint laws and regulations, Manko, Gold, Katcher & Fox, LLP (MGKF) and ALC Environmental hosted a special program entitled "The New EPA Lead Paint Regulations." The breakfast event was held September 16, 2010 at the Crowne Plaza in Cherry Hill, NJ. The speakers were Michael C. Gross, a partner at MGKF, an environmental, energy and land use law firm, and Joseph Sarett, president of ALC Environmental, a national environmental and engineering firm. MGKF partner Michael M. Meloy served as moderator of the program.